According to the Augusta Chronicle, this is Justin Thomas’ assessment of Augusta National and bodes well for the current number five in the official golf world rankings heading into the opening major of 2019. Thomas is priced up at 16/1 in the Masters betting and has the experience of playing at Augusta three times previously, gradually improving on each occasion. He finished a respectable tied 39th on debut in 2016, tied 22nd the following year and then in a share of 18th position 12 months ago. Although the 25-year-old is yet to break the top 10 at the Masters, there are two big reasons based on this season’s form that indicates that he’s a serious contender to win a second major – following the 2017 PGA Championship. Namely, his performances on both par-4 and par-5 holes in PGA Tour events. Did you know that all of the last five Masters winners ranked inside the top seven on the PGA Tour for ‘Par-4 Birdie or Better Conversion’? Thomas currently sits second for this statistic this year, behind Phil Mickelson. Aside from the four par-5 holes, scoring opportunities are relatively hard to come by at Augusta, with such precision needed on approach shots to give genuine birdie opportunities on both the par-3s and par-4s. Also in Thomas’ favour is that he ranks ninth on the PGA Tour for reaching greens in regulation. Do this at Augusta and at worst, it should limit the number of dropped shots in a round. Of the par-5s, the greens on the second, 11th and 15th are fairly comfortably reachable in two shots, presenting obvious stroke-gaining opportunities for the longer hitters taking part. Being aggressive on these holes in particular is pivotal to Masters success. 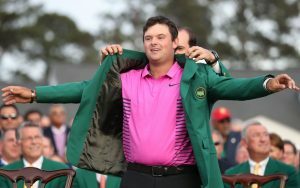 Patrick Reed won the Masters in 2018 and did so through registering the best score across the par-5 holes over the four rounds. He played the 16 holes in 13-under. Thomas has the best par-5 scoring average across the entire PGA Tour this season, registering a birdie or better 73 times across 116 holes. There are numerous other statistics which also point to Thomas being a solid Masters bet at 16/1. He ranks first on the PGA Tour for scoring average and birdie average, suggesting that four under-par rounds at Augusta are well within his compass. Thomas is also positioned in the top-10 for reaching greens in regulation (ninth), first-round scoring average (second) and final-round scoring average (eighth). This suggests he should both start and finish strongly at the Masters. Want more Masters betting tips and analysis? Find out about Charley Hoffman’s superb record in the first round leader betting, three golfers with the potential to outperform their 100/1-plus odds at Augusta, or feast your eyes on our Masters Trends below.